The constituents of the atom are protons, neutrons and electrons. 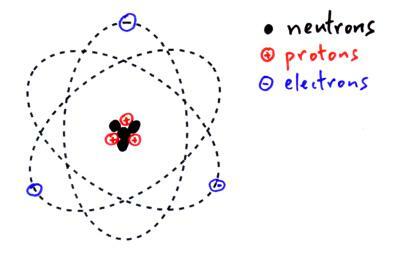 The protons and neutrons (nucleons) are found in the nucleus of atoms. The nucleus of an atom is surrounded by empty space in which there are electrons. Atoms are described by their proton number (Z), which is the number of protons they contain. And their nucleon number (A), which is the number of nucleons their nucleus contains ( nucleon number = number of protons + number of neutrons). For example the element ‘X’ below has a proton number of ‘Z’ and a nucleon number of ‘A’. Example; uranium-235 has 92 protons so it’s proton number is 92. It has 92 protons plus 143 neutrons in it’s nucleus so it’s nucleon number is 235. Isotopes are atoms which have the same number of protons but different numbers of neutrons. Isotopes are all atoms of the same element. We can see below that uranium-238 still has 92 protons but it now has 146 neutrons so its nucleon number is now 238. 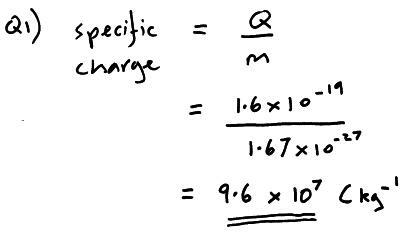 If you divide the charge (Q) of a particle or atom by it’s mass (m) then you will have found the specific charge in coulombs per kilogram (C kg-1). Q1) what is the specific charge of a proton at rest.